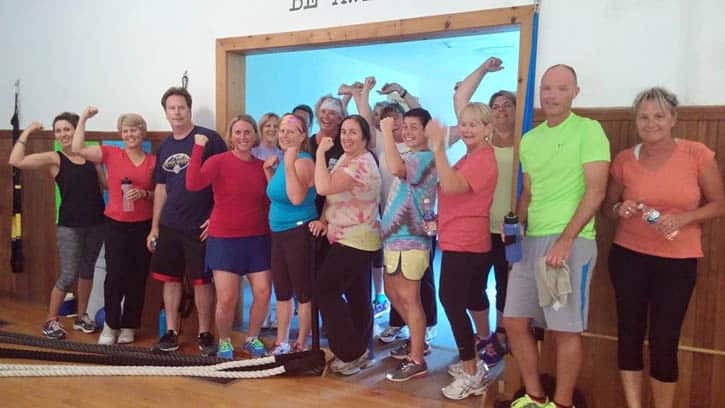 KILLINGTON — Amy Lewis opened the doors of Fusion Fitness on River Road in Killington almost a year and a half ago. She has enjoyed helping locals achieve their health and fitness goals, so much that she has set a goal for herself and her business: help 1,000 people by 2020. Getting fit for Amy Lewis means more than attaining the weight you want to be, it is about gaining and maintaining a healthy lifestyle. At Fusion Fitness, Lewis aims to inspire and support participants along their journey to a healthier self. Not wanting to rely on surgeries and medications that only temporarily, and not completely, relieved her symptoms, she began researching what she could do to help her body. She found answers in nutrition. By controlling what she put into her body, Lewis no longer has any symptoms related to the “un-curable” disease. Another life-altering event was loosing her father to preventable health issues, when he was only 54 years old. By his late 40s he had already had five heart bypasses, Lewis explained. Science has shown over and over that living a healthy lifestyle can help people avoid heart disease, diabetes and many form of cancer, among other medical problems. Over the year, Lewis has learned that setting health and fitness goals will mean different things for different individuals. So each time a person chooses to become part of the Fusion Fitness family, she conducts a thorough Body Transformation intake and evaluation. She asks about current lifestyle (fitness and nutritionally), including physical limitations from injuries or other health issues, to help customize a fitness plan that is just right for each person. Fusion Fitness is hosting an Open House on Monday June 22, from 4-8 p.m. This is open to the public, and is sure to be a memorable, fun and inspiring evening. It will be an opportunity for current clients to share and celebrate their accomplishments with family and friends, as well as an introduction to the community to see what Fusion Fitness is all about, and how lifestyle changes in exercise and nutrition can increase ones quality of life. The Open House will include sample workouts, healthy snacks, prizes and lots of great information. Celestial inspirations: Fun and distractions in Vegas!